Just like the Chrome browser, the Microsoft Chromium Edge also have Lazy image loading feature. In this blog post, learn how to enable it. Microsoft recently released the first preview build of their Chromium-based Edge browser. After having a look at the browser, we managed to find out that preview build in Canary channel has Lazy Image loading feature. Lazy loading feature primarily focuses on mobile devices, but now it is also available for the desktop too. Recently, Google confirmed that Chrome browser to support lazy loading by default, starting with version 75, the information was confirmed by addyosmani engineering manager at Google working on Chrome. According to information on this page, When Lazy loading is shipped in the browser, it reduces memory consumption, data usage, and improve the speed of content above the fold. Scott, the employee from Google explained that Deferred content will load only when the user scrolls down to a particular distance. Lazy loading feature to support Android, Mac, Windows, Linux, Chrome OS, and Android. Since the new Edge browser is based on Chromium, the Lazy loading feature going to work just like in the Chrome browser. It is expected that, when Microsoft is going to release the stable version of Edge browser, the feature will work with default Settings. 1 . First of all, you need to be running Edge Canary build Version 75.0.121.1. 2. Launch Edge Chromium on your computer and in the address bar, copy-paste following flag address and hit enter. This will highlight the Lazy Image Loading flag with Yellow color. Using the drop-down change the settings from Default to Enabled. 3. Click on the Relaunch Now button. This will instantly relaunch the browser to apply the changes. This will enable the Lazy Image loading feature in the Chromium Edge browser. Now if you launch any webpage having lots of high-quality images, then you will notice that those images are loading only when you scroll down to it. You can also check blog post linked above from addyosmani to under how this feature works. 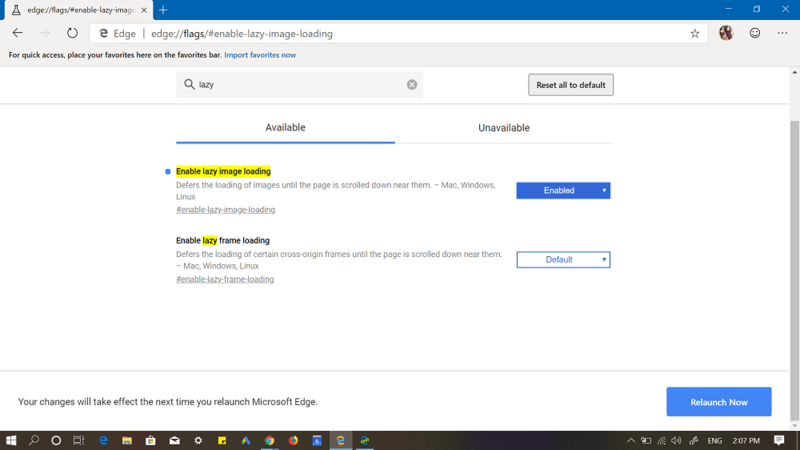 This is how to try Image Lazy Loading in the Chromium Edge. We would like to hear your opinion about this feature in the comments.